I’m glad it’s time to write about my siblings this month, as I had one of those evenings last night where things didn’t go well between them! After much bickering between them about who got the bubbly end of the bath (! ), an elbow in the ribs from Alex saw Sophie wailing, and her big brother in a tantrum about being banished to bed early. It wasn’t my finest parenting hour and left me feeling a bit down about how hard being a mum is and how I could have handled the situation better. Thankfully, as Anne of Green Gables once said, “tomorrow is always fresh with no mistakes in it” – and everyone is back on top form this morning and our siblings enjoyed a good snuggle together on the sofa watching Thunderbirds soon after they were up! And I’m enjoying looking back at photos of the pair of them from last weekend as it’s a good reminder that they are generally brilliant together. 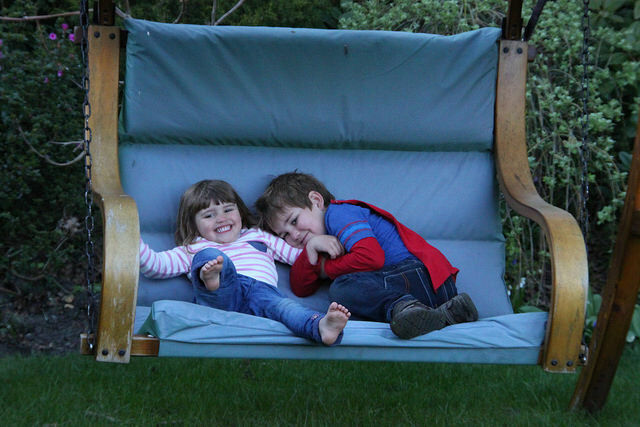 We were back in Berkshire with my in-laws and the children were entertaining themselves on the swinging chair in their garden. 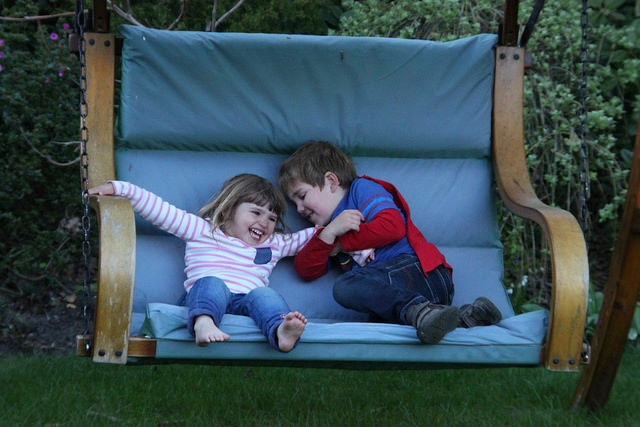 From inside the house, all I could hear were Sophie’s squeals of laughter and Alex giggling. 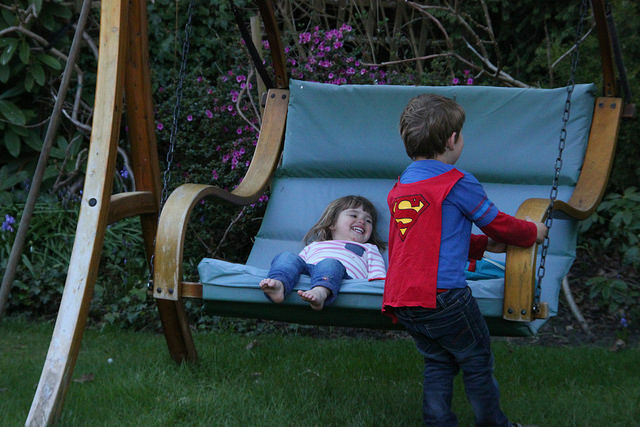 Alex was swinging his little sister high and making her laugh and laugh. I should have recorded it as the sound was so joyful. 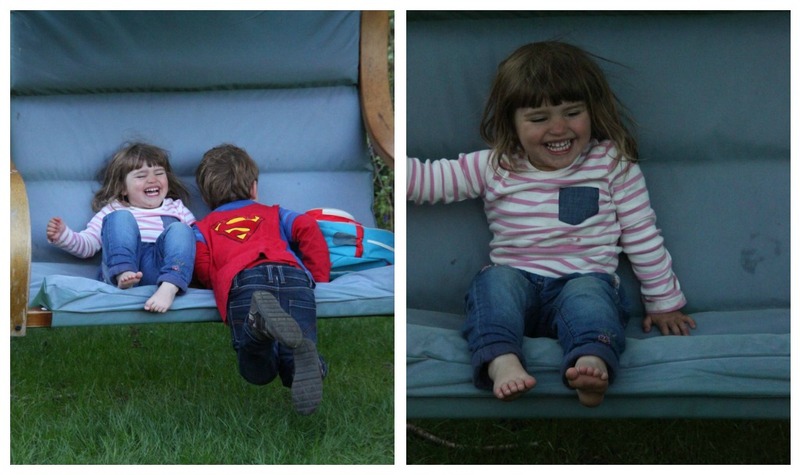 We grabbed the camera and tried to capture some photos – so these are my siblings in April. I love Sophie’s face!